Lorenzo Ruiz was born in Binondo, Manila between 1600 and 1610. The exact date of his birth is unknown since the baptismal records of the church of Binondo were destroyed. Lorenzo had a Chinese father and a Filipino mother. During his youth, he learned Spanish from the Dominicans, whom he served as altar boy and sacristan. He was exceptionally gifted with beautiful penmanship and became a professional calligrapher, earned the title of “escribano” who transcribe baptismal, confirmation and marriage documents into the church’s official books. Lorenzo was also a member of the Confraternity of the Holy Rosary which was organized by the Dominicans in the Philippines as soon as they arrived in 1587. In 1636, a grave crime was committed in Manila, authorities conducted a manhunt for Lorenzo because they believed he knew something about it or was himself involved in it. When Lorenzo learned of some missionary priests leaving Manila, thinking that they were going to Macao, he sought help from his Dominican superiors who believed in his innocence, he was allowed aboard the ship, along with three Dominican priests, only when they were on the ship did Lorenzo learn that the missionaries were headed for Japan, where Catholics were suffering terrible persecutions at that time. When the boat landed at Okinawa and the group was arrested and imprisoned on basis of their Christian religion. They were brought to Nagasaki on July 10, 1636 and subjected to torture by his Japanese captors for more than a year. They were tortured through hanging by their feet, by submerging in water until near death and by water torture. Needles were also pressed in between their finger nails and skin and they were beaten until unconscious. These methods brought some of Ruiz’s companions to recant their faith. It was on September 23, 1637 that he began to undergo “hanging in the pit.” After two days he died from bleeding and suffocation. His body was cremated and the ashes thrown into the sea. According to the documents cited to proclaim him “Blessed,” his parents were devout Catholics. He was christened “Lorenzo” after a martyr during the 3rd century persecution of Christians. His surname “Ruiz” was taken from the last name of his godfather. Lorenzo Ruiz was beatified by Pope John Paul II during the Papal visit in Manila on February 18, 1981 at Luneta Park . He was canonized on October 18, 1987 in Rome. 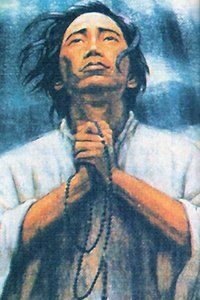 Lorenzo Ruiz’s feast day falls on September 28.